On the occasion of the inaugural ceremony of the 92nd Annual Conference and Concerts 2018 of the The Music Academy on December 15, 2018, Ms Indra Nooyi, Chairman, PepsiCo, USA, honouredSmtAruna Sairam, Sangita Kalanidhi Elect 2018 who will preside over the Music Academy’s Annual Conference this year and will be conferred the title of the Sangita Kalanidhi on January 1, 2019. 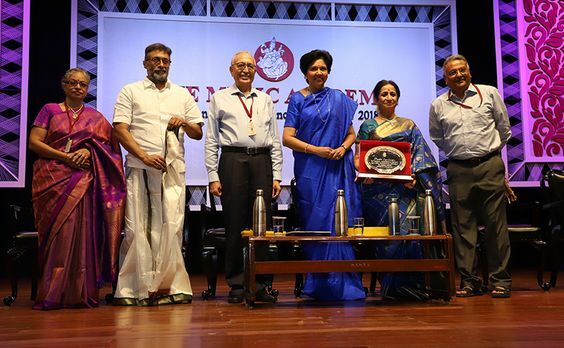 The event began with N Murali, President, the Music Academy, introducing the Chief Guest, tracing her journey from Madras to becoming one of the most powerful women in the corporate world. He also announced the names of all the artistes who will be receiving the many prestigious awards instituted by the Academy. India’s renowned vocalist Padma Shri Awardee Aruna Sairam is widely acclaimed as the most illustrious exponent of classical music. MsAruna Sairam is a Carnatic vocalist, composer, collaborator, mentor, humanitarian and speaker. In addition to her sellout performances in India, from little hamlets to RashtrapatiBhavan, MsAruna is hailed as a Music Ambassador who has taken Carnatic music to the global arena, to prestigious venues including Royal Albert Hall, London, Royal Festival Hall, London and Carnegie Hall, New York. Currently Vice Chairperson of SangeetNatakAkademi, Ministry of Culture, Delhi, wherein she is engaged in shaping the policies of the Indian Government towards the performing Arts. Aruna represents a long line of eminent women singers, her Guru T Brinda being the eighth generation of pre-eminent musicians of the Tanjore Court. Aruna has been mentored by several masters throughout her musical journey. Aruna sings in 14 different Indian Languages as also in world languages. By interacting with national and international musicians, Aruna communicates beyond regional contexts, using melody as a language of human expression. She has performed duet concerts with renowned musicians like Mandolin U Srinivas, Ustad Zakir Hussain, Bollywood singer Shankar Mahadevan. She has collaborated with leading European musicians and presented Carnatic music with Classical Liturgical, Medieval and Gregorian Chants, Arabo- Andulasian, Flamenco and Neo-Classical Music.